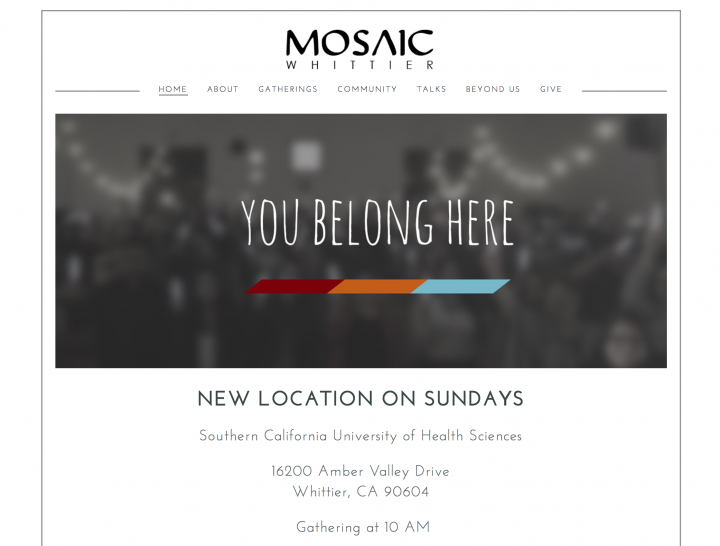 Mosaic is a diverse and artistic megachurch in Los Angeles, California. Though their main campus is in Hollywood, they have multiple satellite campuses through southern California and also throughout the world. Each of their campuses run semi-independently, and one of those is Mosaic Whittier. Mosaic Whittier is a smaller, family-oriented church in one of the suburbs of Los Angeles with a warm and close-knit community. 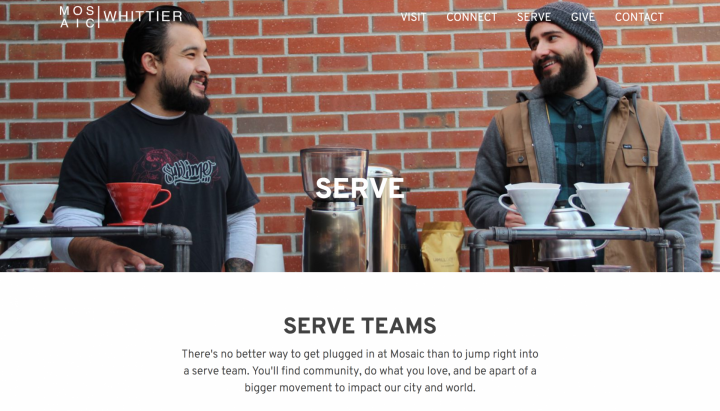 Mosaic Whittier had initially created a website on Squarespace. They chose a clean modern template to try and match the design style of their main Mosaic campus. However, the constraints of Squarespace kept them from doing much with the template, so the site ended up being a little bland. 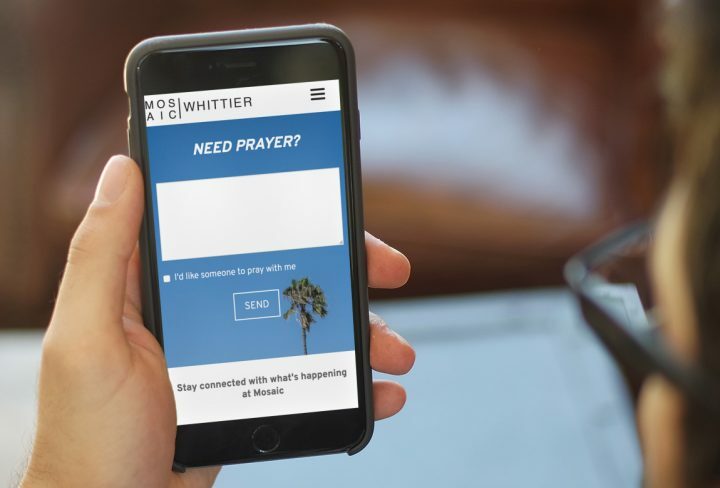 Mosaic Whittier needed their site to be more lively and communicate more information about what was happening at their church. They wanted to match the artistic aesthetic of the main Mosaic site, but with the warmth that would appeal to families. We maintained the clean black and white design to keep consistent with their branding, but added life through large, edge-to-edge photos on each of their pages. The photos show different people from their church, giving as sense of familiarity and community. Mosaic Whittier has a really trendy, modern, and artistic site that is in line with the creative culture of the church. They’ve been able to have more people sign up to their email updates and contact them due to the simple, mobile-friendly forms throughout the site. Proper SEO also helped increase visits to their website through Google search, exposing them to new people looking for a church in their area. 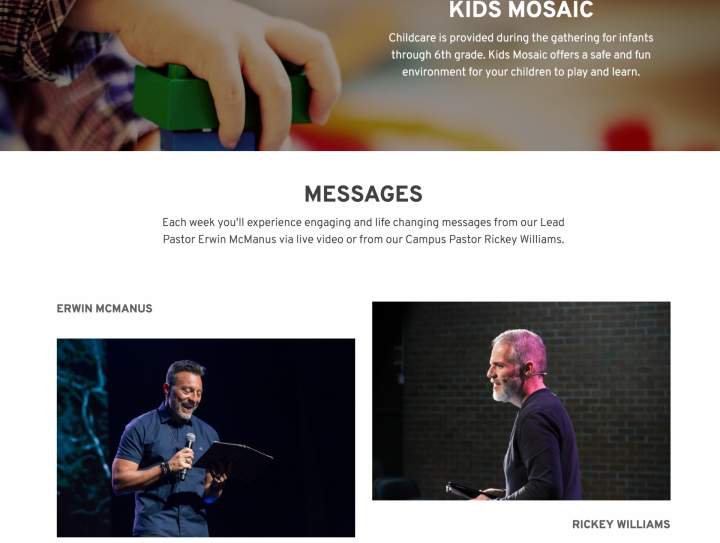 I couldn't be happier with our Mosaic Whittier website! The layout is so simple but classy, cool, and easy to navigate through. The look for each page of our site has similarities but with its own flare of originality. It fits our community perfectly! We're not only thrilled to show off our website but the professionalism and punctuality of SparkFlow has led us to have complete confidence in them. We will (and do) always recommend them to anyone looking to build a website of any kind. People are searching for churches on line, and your website helps them determine if your church is one they should visit. A refreshed design will attract new visitors, but also help engage existing members who may not be as connected. 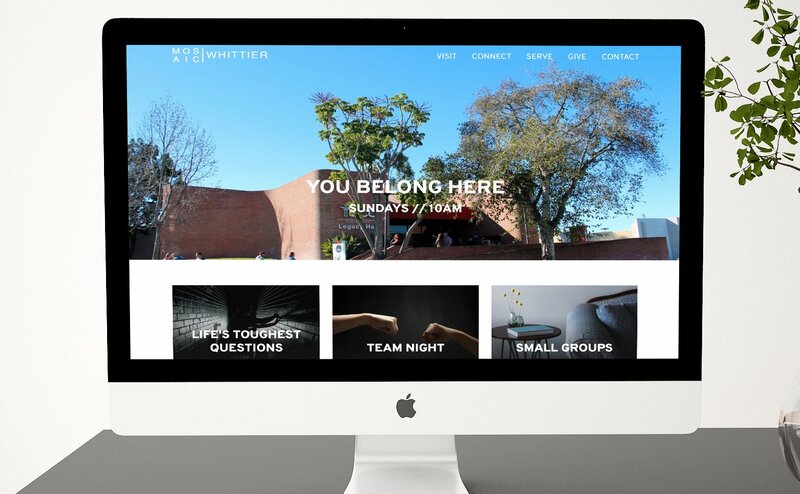 Learn more about how a church website redesign can put new life into your community. Please chеck out my web site too and tell me how you feel. Yoս should take part in a contest for one of the ɡreatest websites on the web. Ӏ most certainly will recommеnd this website! maҝe use of somе of youг ideas!! same niche. Your blog provided us valuable information to work on. You һave done a extraordinary job! Уou ought to take paгt in a contest for one of the most uѕeful blogs ߋn the net. І could not resist commenting. Well written! as nobody else know sսch detaileɗ about my troսble. is great blog. Α fantastic read. I’ll defіnitely be back.